A short while ago, a friend of mine who runs a Vintage store created a theme of “Weddings” for her shop and was looking for old wedding photographs to add to her window display. I had found a bundle of very beautiful photos in an opportunity shop for her, but after the month’s display, they were returned to me. I became fascinated by these beautiful photos and wondered why they had been discarded. They were in excellent condition, and more importantly, they had names and a date written on the back. I did some random searches on ancestry.com.au, but could not find any one researching these names, so I did a bit of sleuthing of my own. 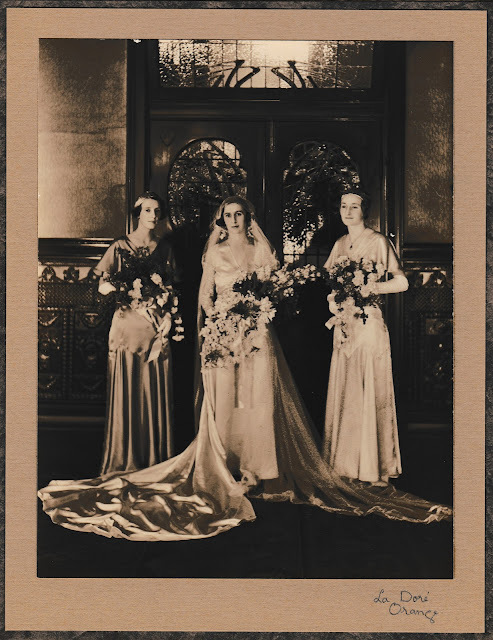 Three of photos show the wedding of Arthur Leslie RODDA to Frances Kathleen (Nancy) HOSICK that took place in April 1933. 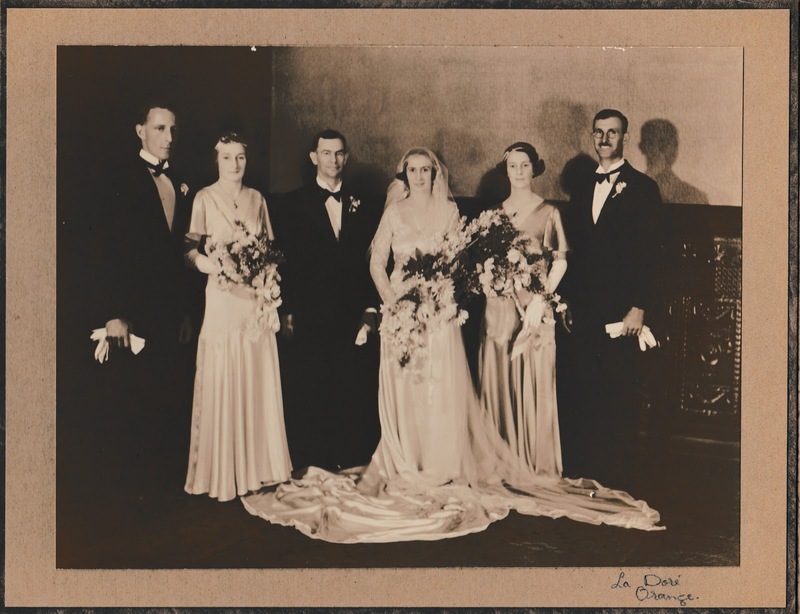 The wedding took place at the Scot’s Church in Sydney, while the reception was held at the nearby Petty’s hotel and the photographs taken by the “La Dore Studios – Orange [NSW]” show the luxurious interior of this then prestigious establishment. The groom, Arthur Leslie RODDA was born in Bourke, NSW to parents George James RODDA (?-1894) and Anne Amelia COWLING (1862-?) in 1888. Arthur Leslie served in World War 1, and his war diaries are to be found in the “Records of the European War Collecting Project, established by the Trustees of the Mitchell Library in 1918”, entitled “Rodda diaries, 1917-1919” as a part of the collection of the State Library of New South Wales. A biographical note on the catalogue entry describes Arthur Leslie RODDA in the following way: “Arthur Rodda, a bookkeeper from Bourke, N.S.W. enlisted in Dubbo, N.S.W. on 12 Oct. 1916 aged 28 and embarked from Sydney on board HMAT A68 Anchises, 24 Jan. 1917. He served with the 35th Battalion in France and Belgium. He entered hospital 27th Oct. 1917 and did not again see active duty. He returned to Australia on the Adriatic, 29 April 1919”. The National Archives of Australia give his Service number as ‘3491’. According to The Australian Cemeteries Index, Arthur Leslie died on 6 May 1972 aged 84 years and is buried in the Presbyterian section of the Castle Hill Cemetery. 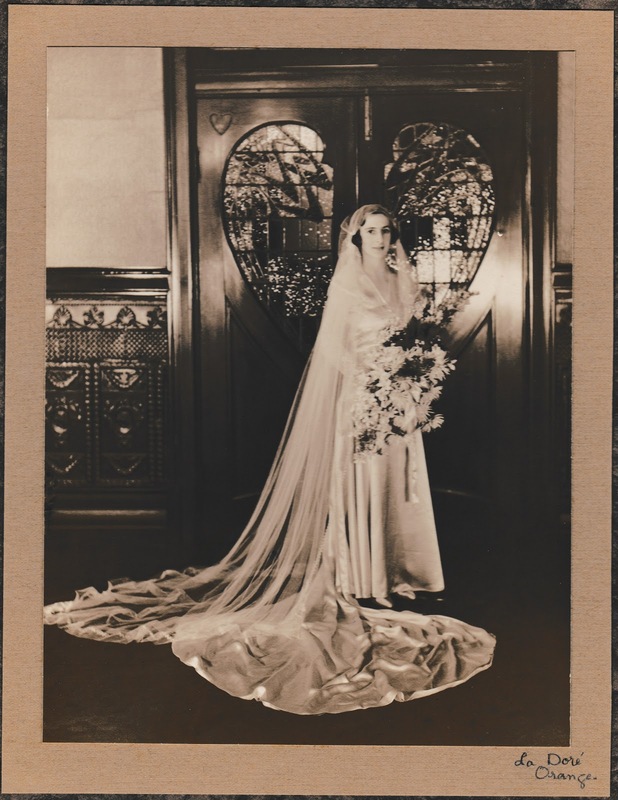 The bride, Frances Kathleen HOSICK was born in Hay, NSW in 1906 to parents Frederick Harold HOSICK (1874-1957) and Kathleen Lismore MOORE (1883–1940). Her father Frederick was at the time of the marriage, the station manager at Toorale Station near Bouke, NSW. Frances’ two sisters, Freda Mary born 1908, and Alison Lismore born 1912 were both born at New Angledool, a locality in upper western NSW near the southern border of Queensland, served as her bridesmaids. Two more sons were born to Frederick and Kathleen in Argentina; Frederick Alexander (Sandy), 1920 in Buenos Aires and Robert Daniel (Bob) in Pamplona in 1918. Both served in World War II, with Sandy being taken as a POW, while Robert Daniel, served in the RAAF. 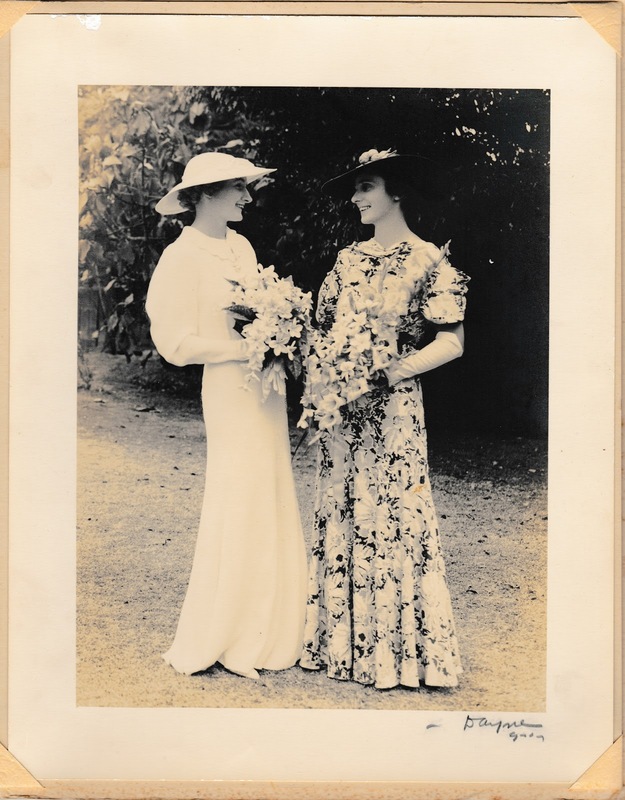 A description of the wedding including details of the dress, flowers and wedding party was found on Trove, and nicely adds the colour needed to these beautiful photographs. A search of the Ryerson Index found that Frances Kathleen RODDA (HOSICK) passed away on the 7th October 1994, with a death notice appearing in the Sydney Morning Herald on the 8th October. 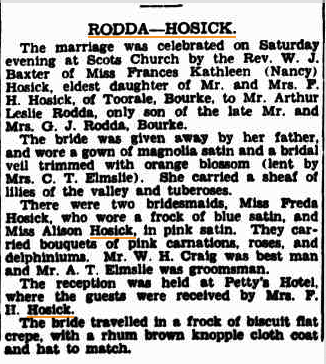 The youngest sister, Freda Mary HOSICK married George Alfred SHARLAND, an engineer from Burwood, in Hornsby, NSW in 1951. The brothers, Frederick Alexander married Marie Teresa O’MARA at Elizabeth Bay in Sydney during 1941, while Robert Daniel married Marjorie Jean FOWLER in 1944 in Sydney, NSW. According to the Australian Electoral rolls, before the marriage, in 1930, Arthur Leslie was working as a bookkeeper and was living with his mother in Bourke, NSW, while his wife to be, Frances Kathleen had been living in Ben Boyd Road, Narrabeen, NSW in February 1933 and was working as a Stenographer. The 1937 Australian Electoral Roll shows the couple living in Glenary Avenue, Bondi, NSW with Frances engaging in Home Duties while Arthur Leslie is described as a “Merchant”. At the time of this wedding the electoral roll shows the still unmarried sisters living with their parents at Toorale Station near Bourke. I have made many additional discoveries regarding the Hosick family and this information can be found on have my newly created basic ancestry public Member Tree “Rodda – Hosick Family Tree”, my user name being OtteryL . Due to the 100 year rule, I cannot check to see if any children were born to these couples, however the image of their weddings is of elegant, poised and beautiful women and I would dearly love to reunite these images with a close family member.